SanDisk has announced more new storage cards for portable music players and mobile phones. The first, the micro multi SD kit contains a microSD card along with two adapters; one for MiniSD and one for normal SD. With the adapters, the miniscule microSD card will be readable by standard SD card readers. 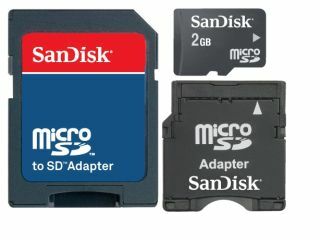 The 4.0GB SDHC microSD is the next generation of microSD cards. Like its SDHC big brother, the microSD card may eventually reach double figure capacity sizes. The increased size will allow more MP3s, pictures and videos to be stored on a mobile phone. While older SD devices cannot read SDHC, it may not be the case for SDHC microSD. However, it seems the cards the cards won't be immediately compatible with all phones the cards fit in because of the new capacities. SDHC is the new designation for any SD or SD-based card that is larger than 2GB. In reality, this is likely to be supported by new handsets, rather than necessitate firmware upgrades in older models. SanDisk is also releasing an 8GB iNand embedded flash drive. The drive will be used by SanDisk and third parties for portable media devices such as digital music players. The micro multi SD kit and 4.0GB SDHC microSD will both be out later this year, prices to be confirmed.